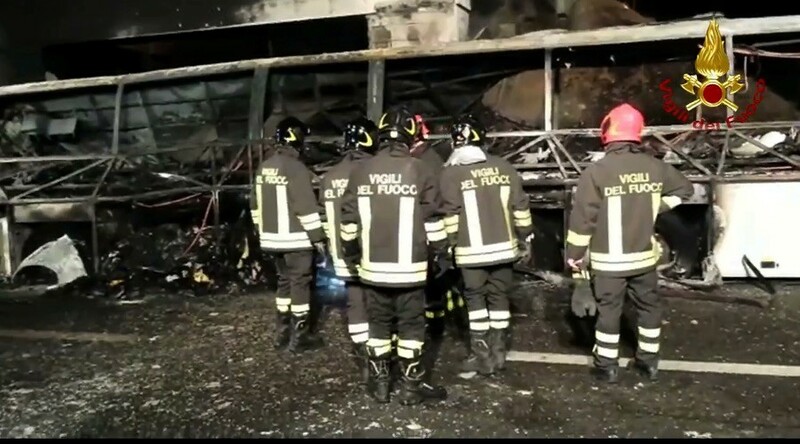 A bus in Italy carrying schoolchildren collided with a pylon and caught fire, killing at least 16 people, according to authorities. At least 39 people have been injured. The Hungarian bus was heading back to Budapest from France. The incident occurred as the bus was exiting the A4 highway outside Verona on Friday. There were 55 people on board – 50 of them teenagers. — ultimaedizione (@red_ultima_ediz) 21 января 2017 г.
Italian news agency Ansa said the children were mainly boys, aged 14 to 18. Some had reportedly been thrown out through the window upon collision with the pylon. Others were trapped inside as the vehicle caught fire. Most of the teens are thought to have burned alive. Ten are reported to be in hospitals with very serious injuries. The death toll is not expected to increase, according to the fire department. — Polizia di Stato (@poliziadistato) 21 января 2017 г. Another 15 children on the bus received lesser injuries, and are expected to be discharged today. An investigation into the cause of the tragedy has been launched, with various explanations being considered, including the driver’s health, as well as sudden mechanical failure. Police and emergency services have been at the scene all night and morning.